I call this the Ultimate Mac & Cheese because it is loaded with three types of cheese - Havarti, White Cheddar and Parmesan. YUM! 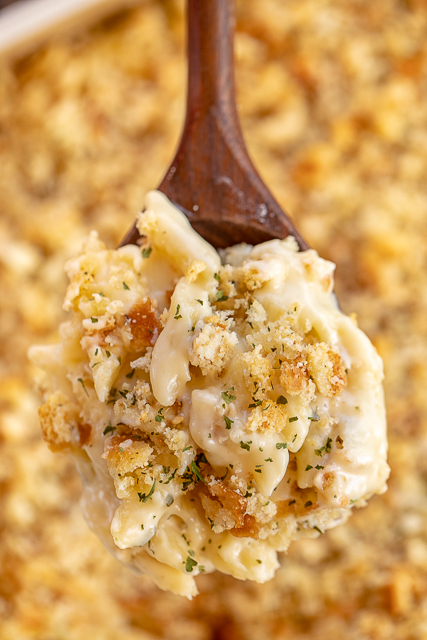 The Mac & Cheese is topped with yummy garlic parmesan breadcrumbs. Seriously delicious. Most of the work for this Ultimate Mac & Cheese is done on the stovetop. I popped it in the oven just to crisp up the breadcrumbs. Now, you can totally make this in advance and refrigerate it. You will just need to up the cooking time to at least 30 minutes to get it heated through. 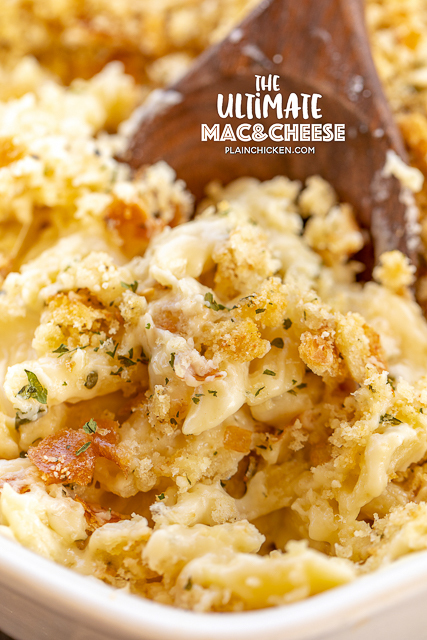 We LOVED this Ultimate Mac & Cheese. The combination of cheeses was perfect. 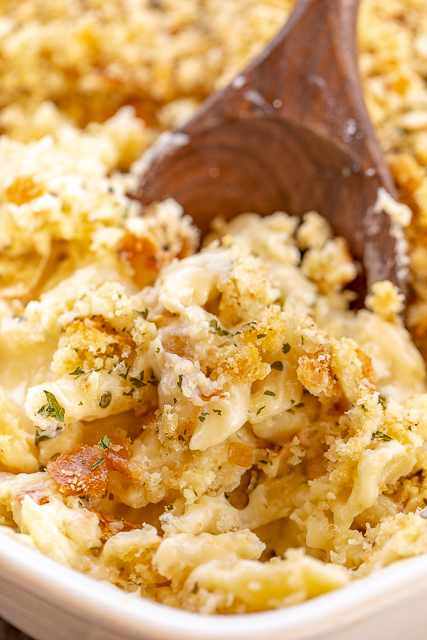 My favorite part of the whole casserole might have been the yummy garlic parmesan breadcrumbs. Perfection! 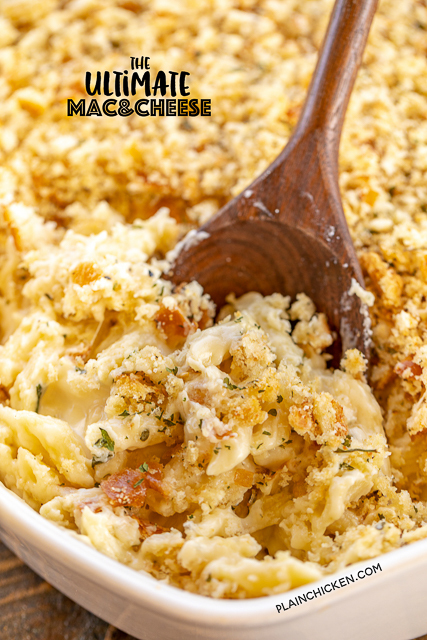 This makes a lot of mac & cheese, so this is perfect for dinner parties, potlucks and cookouts. I have this on my list of sides to make when we have football parties this Fall and for the holidays! In a large saucepan over medium-high heat, melt 1/2 cup butter. Whisk in the flour and cook for 1 to 2 minutes. Slowly whisk in milk until well blended. Reduce heat to medium and cook 5 minutes, until thickened. Stir in Havarti, white cheddar and parmesan cheese. Remove from heat. Stir in salt, pepper, cayenne pepper and 1/2 tsp garlic powder. Combine cheese sauce and pasta, stir to coat. Spoon pasta into prepared pan. Combine fresh bread crumbs, melted butter, garlic powder and parmesan cheese. Sprinkle on top of pasta. Bake uncovered for 15 to 20 minutes, until topping is golden brown. Oh my goodness this looks amazing! We love mac&cheese at our house. Definitely going to make this soon! Any suggestion pre making it so it is not dry. And cooking instructions?? ?